Since I went low carb, I sometimes have cravings for things that are unfortunately off limits. I will struggle to stick with anything where I feel deprived so I try to come up with solutions that satisfy. This idea was born from such a craving. I wanted a chicken pita slathered with tzatziki so bad that I would have given my left pinky toe to get it. I turned that craving into these yummy bowls. This is one of those recipes that is more an idea but flexible enough for you to tweak to your preferences. Marinate the chicken in the greek dressing for a couple of hours or overnight. Spread the riced cauliflower out on a greased baking sheet. Season with salt and pepper. Baked for 15-20 minute until it starts to brown. 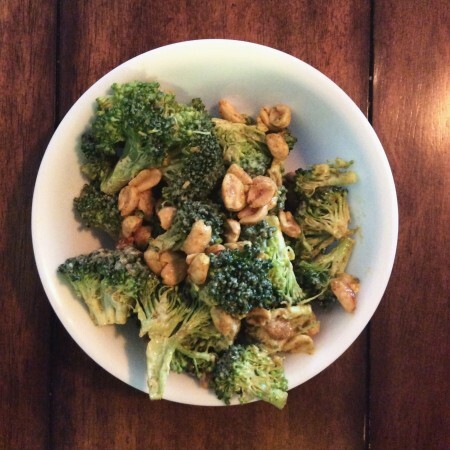 Alternatively, you could steam the cauliflower but I prefer the flavor when roasted. While the cauliflower is roasting, grill the chicken. When it’s done cooking, dice it. Build your bowls by putting a little bit of cauliflower rice in the bottom of the bowl. Top with chicken, tomatoes, cucumbers, tzatziki and feta. The good news is you don’t have to be number three. Just because you (like me) don’t like black licorice doesn’t mean you won’t like fennel. I adore it and once it is cooked, it doesn’t have a hint of black licorice or I’d give it away at pickup. This recipe is so comforting and cooks up in one pan. I think you’ll find this recipe is a delicious way to move yourself up to number one. Drizzle the olive oil in a skillet over medium heat and cook your sausage until it starts to turn brown. Add the onion and garlic to the pan. Cook until they became fragrant but not too brown. 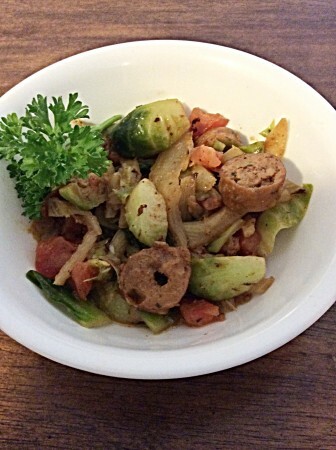 Add your fennel and brussel sprouts. Cook until the fennel starts to brown. Deglaze the pan with the beef broth. Stirring occasionally, cook until most of the liquid is gone. Add the tomatoes, parsley and salt and pepper. Cook for a couple minutes so the flavors can combine then serve. It isn’t just fall, it is pumpkinpalooza! This is the time of year when I go overboard on buying pumpkins for every corner of my house and cook pumpkin in everything that I can get away with (without driving my family too crazy). I spent the day at a field trip at a farm with my daughter’s kindergarten and was absolutely exhausted when I got home (kudos to our teachers for doing that everyday!). I had roasted and pureed pumpkin in my fridge so this soup was low effort, warm and comforting – just what the doctor ordered! Of course, you could also use canned pumpkin. Put the sausage in a large pot and cook until brown. Add the onion, garlic, crushed red pepper and parsley and saute until fragrant. Deglaze the pan with the water. Add pumpkin and combine. Mix in the broth and simmer for 20-30 minutes. Stir in the milk and simmer on low for 10-15 minutes. Add salt and pepper to taste. Beat together the milk and egg in a small bowl and set aside. In a large bowl, whisk the flour, baking powder, and salt together. Cut butter into the flour mixture with a pastry blender or butter knives until it the pieces are smaller than pea-sized. 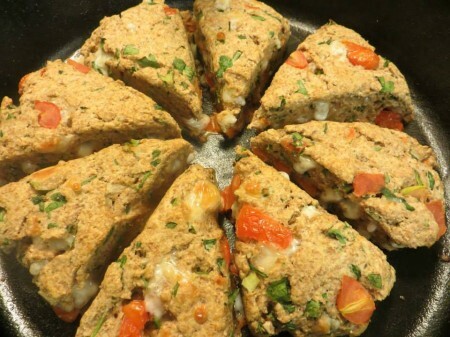 Toss the tomatoes, mozzarella, spinach, green onion, and parsley into flour. Reserve 3 T of the egg mixture to brush on top later. Add the remaining egg mixture to the flour mixture and mix together until the flour is consistently wet. This may take a while but don’t over mix. Put dough on floured surface and knead 10-12 times. Pat dough down into a circle that is about 1/2″ thick. Cut into 8 wedges. Place in a cast iron pan or ungreased baking sheet. Brush the wedges with the reserved egg mixture. 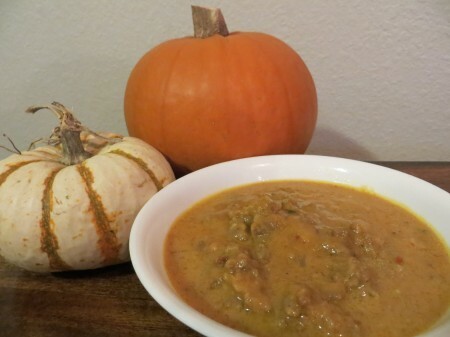 We got a couple of fallish days (okay… maybe it was just the morning) in Central Texas recently so I promptly pulled out my boots, scarves and made this fabulous soup. 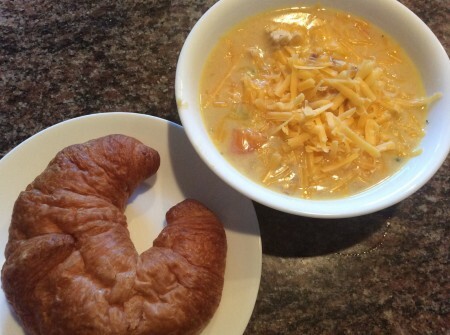 This soup really hit the spot with some bread (I had crescents on hand but a crusty bread would be great) and a glass of wine. My family is weird and aren’t really “soup people” but they loved this and my husband said the leftovers were fabulous for lunch the next day. This is the kind of soup that warms your body and your soul. Make a roux by heating the butter in small skillet. Once the butter is melted, sprinkle the flour in and whisk until combined and it turns golden. Take off the heat and set aside. Heat up your oil in a large pot and sauté the carrots and celery. When they start to get soft, add the onions and garlic. Add all of the other ingredients (including the roux). Bring to a boil then reduce to low and simmer 20 minutes. Stir every few minutes to avoid burning. Remove the bay leaves. Serve in bowls with a sprinkling of cheese on top. We loved soaking this soup up with our bread. I love having special spice blends in my pantry so it is easy to whip up meals. During the winter, when citrus is plentiful, I zest the fruits and let it dry on a napkin then store it in a jar. I used that zest in this blend along with Rosemary. 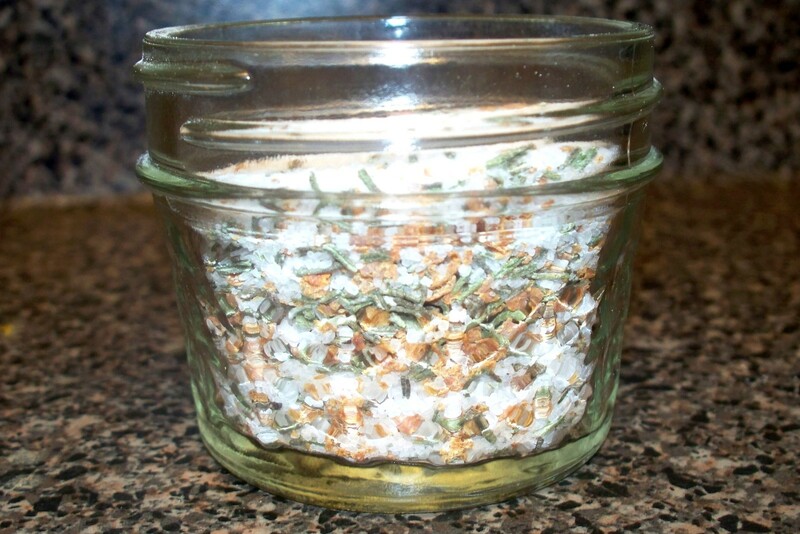 This blend is wonderful fragrant and tasty on poultry or roasted veggies. Put all of the ingredients in a food processor and pulse until well blended. You don’t want to overpulvarize the salt. When I was a child, we showed horses. Some of the fondest memories of my life were during this time. Believe it or not, this recipe was inspired by these fond horsey memories. I remember going to the Quarter Horse Youth World Show in Fort Worth and ordering these HUGE, loaded baked potatoes. As memory serves, you could top them with whatever incredible topping you wanted. I would load it up with bacon and cheese (of course) and broccoli. Amazing! This fabulous soup is that loaded baked potato in a bowl. 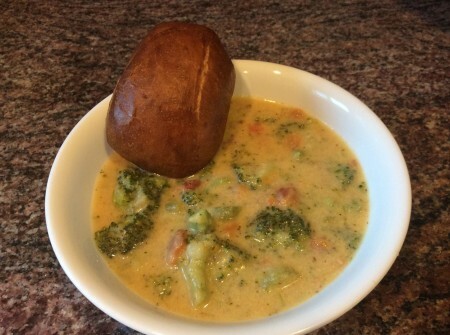 My five year old loved this recipe and typically doesn’t like soup (just as a rule). She is going through a phase where she tells you that she is allergic to things that she doesn’t want to eat (water allergy, anyone?) and she proclaimed that she wasn’t even allergic to this. This rich soup is a winner in my house (of course, bacon and cheese helped). I served this with a pretzel roll but any crusty bread would be delicious. In a large pot, combine the broth, carrots, celery and potatoes. Bring the mixture to a boil then reduce to medium. Cook 10 minutes. Add the broccoli to the pot and cook for another 10 minutes. In a separate medium saucepan, cook the bacon. Once it is nice and crisp, move the bacon to drain. Whisk in the flour and cook for 1-2 minutes until golden, stirring constantly. A little at a time, whisk in the milk and cook until the mixture has thickened. Stir in the cheese one handful at a time, adding another once the cheese has melted. Slowly stir the cheese sauce into the vegetables, whisk to combine well. Add the bacon and salt and pepper to taste. I only added a little pepper but didn’t need any salt for my taste. Salads are a great way to use up my co-op basket contents and it is just so convenient for me to keep a huge bowl of salad in the fridge. I serve salad as sides several nights per week so I try to keep salads interesting for my family and one of the easiest ways to do that is by keeping tasty dressings on hand. We all love jalapeños in my family (even my 5 year old) so I wanted to make a jalapeño dressing. 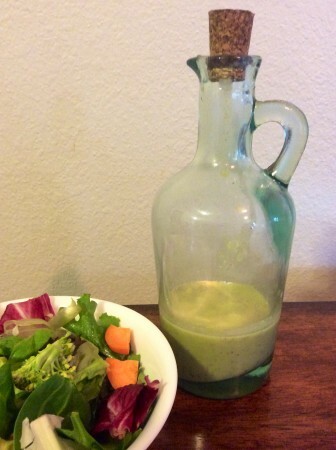 The result is bright and flavorful jalapeño vinaigrette. My daughter declared that this dressing was better than pancakes. Put the jalapeño in a food processor or blender and roughly mince. Add the garlic clove and mince. The mustard should be added next and blended a little. Pour in the vinegar, salt and pepper. Blend. While the food processor is running, slowly add the oil. 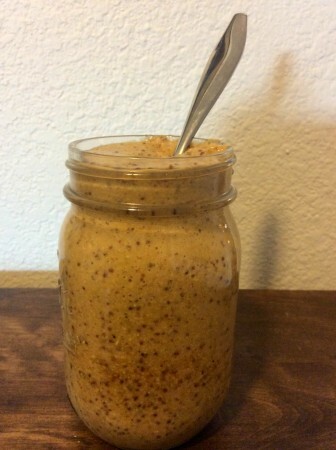 Adding the oil as slowly as possible is critical to getting a creamy, emulsified dressing.